No matter what you are putting in a self storage unit, one of the most important considerations is whether or not you are protecting what you are storing. This consideration implies both security and environmental considerations. If you are a business owner and are putting classified business documents into storage, there are special measures to be taken both your your and for your clients’ sake. Below are 4 tips on storing classified business documents you are going to want to keep in mind. One of the first considerations is the weather. If you live in a part of the country that receives a high amount of humidity and inclement weather, then protecting anything made out of paper from water damage is going to be a top priority. Climate controlled storage is a must for document storage, especially if you plan on storing anything paper over long periods of time. If you are storing vital business information, regardless of whether it is your own or on behalf of your clients, you want to protect it from natural disaster. Fireproof filing cabinets are a good investment for business owners storing their documentation off-site in self storage units. These can provide vital protection in the event that something catches fire (either in your unit or an adjacent one) and will give your customers peace of mind that they information is well looked after. Document storage (and really storing anything that is sensitive or of high value) means you are going to need to invest a bit extra in your security measures. This means opting for a lock that will stand up to bolt-cutters. Cheap locks are easily dispatched by a strong pair of bolt cutters which is why you should be looking for a lock especially designed to withstand this kind of force. Document storage also means selecting a storage facility that doesn’t skimp on security. You want to shop around and make sure the storage facility you are doing business with takes site security seriously and has camera systems, as well as vigilant staff that make sure your belongings are looked after and secure. Many business owners have had great success moving their document storage off-site to a self storage facility. But not having your business documentation in your possession entails some security measures and precautions to keep your and your clients’ information secure. 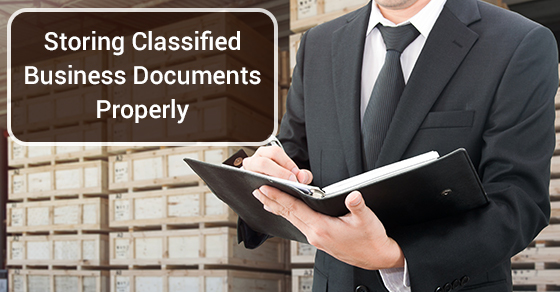 Keep the above classified document storage tips in mind and ensure you are always protected.